​ first step in straightening your horse. You need to learn how to ride shoulder-fore in order to straighten your horse. Horses start out life crooked--bent slightly in one direction. When you ride a circle, you may have noticed that your horse bends more easily going in one direction than the other direction. 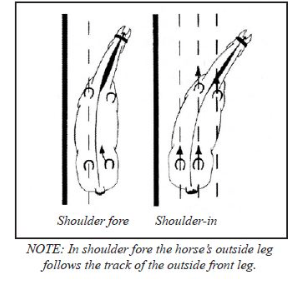 That is because your horse is bent either to the right or the left, as shown in the illustration. (Photo credit: Straightness Training). ​When you ride a circle that fits your horse's natural bend, it will be easier to get him to bend through the circle. In fact, it may be too easy, as shown in the illustration. (Photo Credit: Straightness Training) If your outside rein isn't placed and used properly, your horse's outside shoulder may "pop" out too far and his haunches may swing toward the outside. As a result, the circle gets larger and larger. It will also be easier to get your horse to canter when going in this direction. ​When you ride a circle that is opposite to your horse's bend, it will be very difficult to get him to bend properly through the circle. Instead, he will "fall in" on the circle, and the circle will get smaller and smaller. 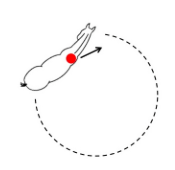 (Photo Credit: Straightness Training) Your horse may also resist picking up the canter on his convex side. He may buck or kick out when you ask for canter. The first step to straightening your horse is shoulder-fore. Simply put, when riding shoulder-fore, you ask your horse to bend slightly through his body such that one of his shoulders "leads" the way as he travels forward. Here is what it looks like. And below is a video so you can see what it looks like when it is ridden in canter. The easiest way to learn shoulder-fore is to ride it out of a circle. Begin by tracking left down the rail. When you reach the corner, ride the smallest circle your horse can comfortably manage. A ten meter circle is ideal. Feel your horse's bend in the circle. As you come out of the circle, your job is to help your horse maintain that same bend as he travels straight down the rail. His shoulders should move SLIGHTLY off the rail to the inside so that his right shoulder is pointing forward and his left shoulder is off the rail and slightly behind the right. Your aids will go like this: Half halt before you ride out of the circle, put a bit more weight in your left seat bone, and press with your left (inside) leg at the girth. Be sure to keep your outside leg behind the girth, holding the haunches in place so that they don't swing out. Otherwise, you will lose the bend and your horse will end up doing a leg yield. Gently squeeze the inside rein, keeping the rein very near the horse's neck. The outside rein should remain firm to prevent the neck from "jack-knifing" into an exaggerated bend. Your outside rein should be at wither level, just outside the wither. These aids will drive the horse along the rail while helping him to maintain his bend. You can read about how to do a shoulder-in by clicking here.